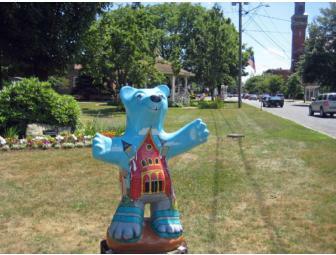 Whimsey Wilbear can be seen as the city of Easthampton’s mascot. 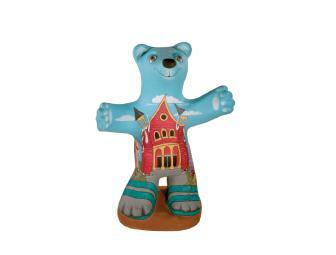 Old Town Hall is brandished across his belly while various city landmarks encircle his body including the Young World Child Care Center, which is housed in a nineteenth century church and Pulaski Park. 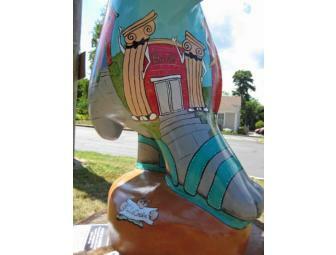 Whimsey Wilbear is a colorful character and is painted in shades of blue, red, and white. 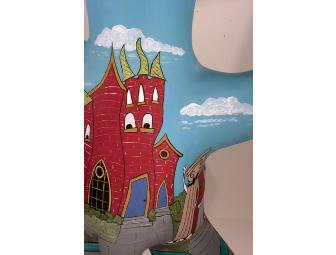 Not to mention that the buildings come to life with a cartoonish charm tipping their hats to us. Gary LaCroix is one of the ten returning artists from the 2009 Bear Fest. For several years, he has been donating his art to help raise funds for Relay for Life. Gary is the illustrator of the children’s book, Pound Puppy to Fire Dog: The Story of K-9 Dakota, Dakin’s hero Dog 2011. Gary is a volunteer artist for the annual Santa’s Trains at Look Park and a member of the Easthampton City Arts+. Approximately (H x W x D) 36 x 26 x 13 in. 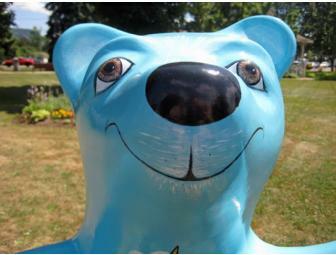 This Bear has been coated with a UV protected auto coating, courtesy of Full Tilt Auto. The log base is available to the winning bidder. Your support matters, so Easthampton City Arts+ would like to use your information to keep in touch about things that may matter to you. If you choose to hear from Easthampton City Arts+, we may contact you in the future about our ongoing efforts. Copyright © 2003-2019 Easthampton City Arts+ and BiddingForGood, Inc. All Rights Reserved. Designated trademarks and brands are the property of their respective owners.